Perhaps the most controversial dog breed in the world, the American Pitbull Terrier has seen its share of bad press. This is unfortunate, due to the fact that these dogs can make for superb pets given the right owner and upbringing. The best approach in explaining this breed is to provide the facts as plainly as possible. For those considering adoption, it is absolutely necessary to know what you are getting into before adopting a Pit Bull - above all, it is the unpreparedness and misconduct of human owners that has led to this breed being seen as it is. 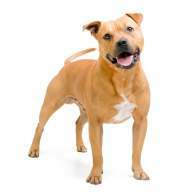 First of all, the Pit Bull is a type of dog, but the American Pit Bull Terrier is a breed. 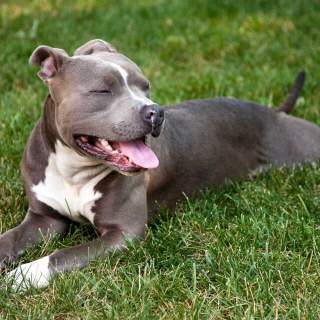 Other breeds that fall under the term Pit Bull include the American Staffordshire terrier, the American Bulldog, and the Staffordshire Bull terrier. All of these breeds got their classification from their origin as dogs bred to fight in the pits in England. The American Pitbull Terrier has had the misfortune of being labeled the "dangerous dog" of our time according to the public. But as any responsible Pit Bull owner will tell you, these dogs are not evil - in fact, they can be some of the sweetest dogs around. A great deal of the problem stems for the fact that there are people who buy and train these dogs for the sole purpose of being aggressive, and not because they're inherently so. Any poorly-trained dog can be a menace. A Pit Bull who receives love and proper training can be as pleasant and well behaved as any other dog. The Pit Bull is actually regarded by many as a highly sociable and friendly dog. They are very smart and do well with kids. Due to their blood sport history, however, these dogs will have problems with other dogs and animals if not properly socialized. It is imperative that socialization and training start from puppyhood and continue on through life. This is not a breed for those who aren't willing to invest time in training and can't or won't provide consistent, firm guidance. The American Pitbull Terrier is a fantastically hard-working dog that just wants to please. Whether it is a guardian or a family companion it will aim to make its owner happy. Give it the tools it needs to succeed and you'll be rewarded with an extremely devoted and friendly dog. 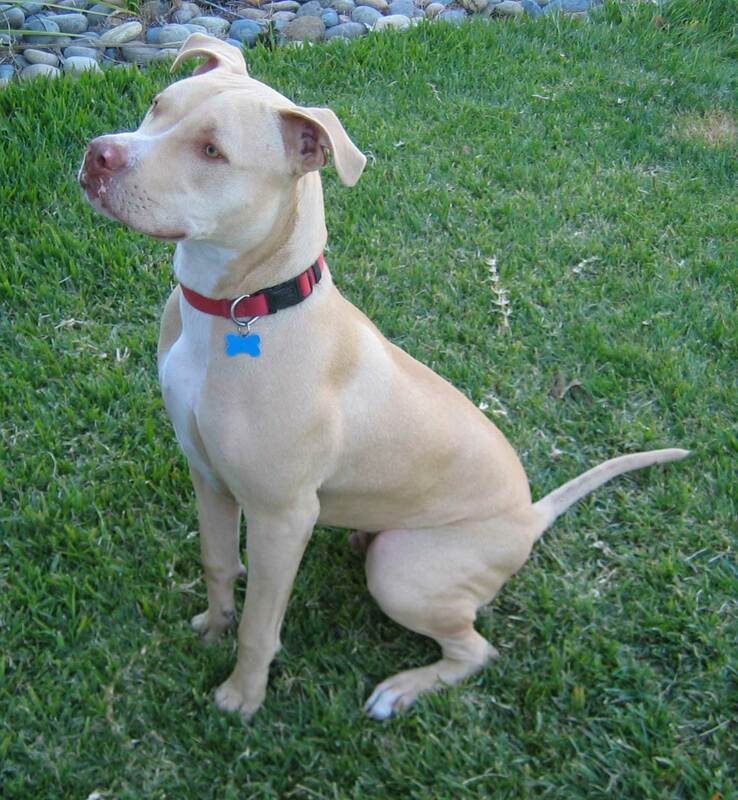 Below are the details and facts for the Pitbull dog breed. This is a medium to large sized breed. You can expect an adult male to reach a height of 18 to 20 inches from ground to shoulder. Females will reach a height of 17 to 18 inches. Weight ranges from 30 to 90 pounds. These dogs are very agile and strong, allowing them to excel in tasks ranging from guarding to agility trials. These dogs are obedient to a firm, pack leader master, and very loyal. They are not aggressive towards people, but can be towards other dogs and pets. They are great with children in the family, they have a high pain tolerance and will happily put up with rough child play. Proper socialization and training are absolutely mandatory with this breed. Expect to spend at least an hour a day walking, playing with or otherwise exercising this dog. They will enjoy all types of dog games and are very capable workers. These intelligent and hard-working dogs require the stimulation that exercise provides in order to be at their best behavior. Grooming is simple and should not require a great deal of time. As far back as the 1200's, dogs were engaged blood sports such as bull and bear baiting in the United Kingdom. Dogs would be thrown in a pit with an animal, where the two animals would fight to the death. It is thought that most of these fighting dogs were variations of the Old English Bulldog. In 1835, baiting became illegal in Great Britain, but a new and equally vicious pastime arose: dog fighting. People aiming to create the best fighting dog crossed the English Bulldog with either the white English Terrier or the black and tan terrier, thus spawning a new breed that would be known as the Pit Bull. The effect of this cross was to make a breed that was aggressive towards other dogs, but kind towards humans. The handlers at the pit fights did not want the dog to hurt them when it was extracted from the pit. The breed quickly became known for its strength, courage, fearlessness, and also its affectionate attitude towards people. Soon after these dogs began to be seen in America. Immigrants arriving from Europe brought these dogs and began to use them as all-around farm dogs. They were used as farm guardians, big game hunters, and family companions. In 1898 the United Kennel Club named these dogs the Pit Bull Terrier. In the 1930's, the American Kennel Club recognized the breed as well, but opted to give it another name to separate it from its violent past - they called it the American Staffordshire Terrier. Since then the American Staffordshire Terrier has been bred for dog shows in accordance with the AKC standards, while the American Pit Bull Terrier has not. This has resulted in slight differences in build and in personality. There is still debate over the extent to which these breeds are different today. Whatever the case, these dogs were often in the spotlight. The famous boxer Jack Dempsy, Teddy Roosevelt, and Hellen Keller were all noted lovers of the breed. During World War I, the American Pit Bull Terrier, admired for its courage and hard work ethic, was chosen as a mascot for the American army, and many accompanied American forces to the battlefront. Though these dogs were an American family staple through most of the 20th century, in recent years they have gotten a bad rap. 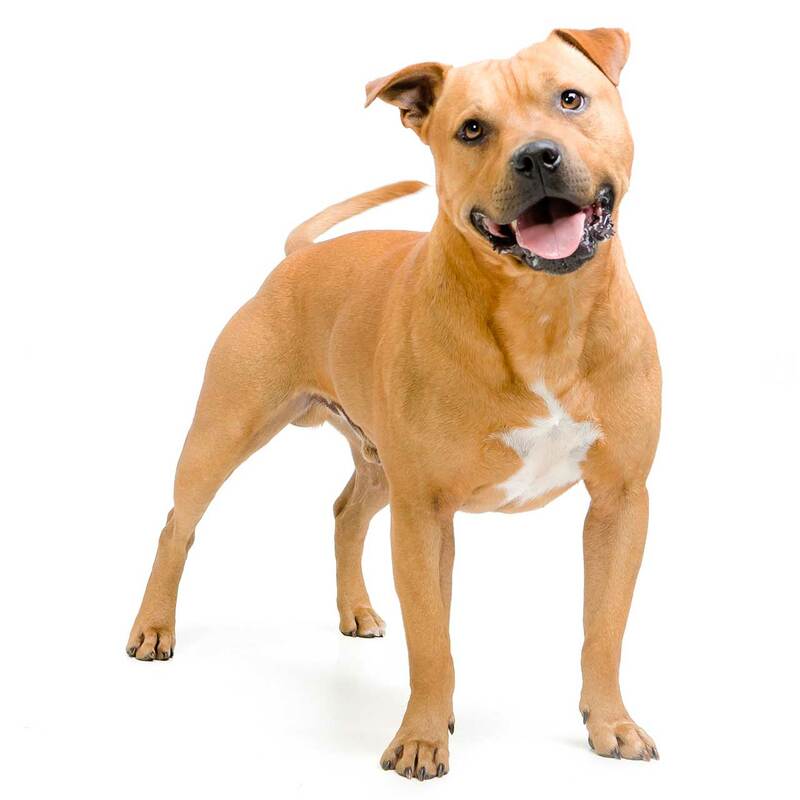 Dog attacks that are reported to the media often castigate the Pit Bull, and they are sometimes associated with gangs and other undesirables who acquire these dogs and train them for aggression. 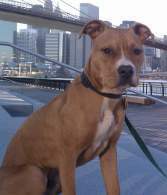 As a result, the American Pit Bull Terrier has been banned or restricted in many countries and even some American cities. This list includesthe United Kingdom, Australia, Puerto Rico, Singapore, Canada, Ecuador, Malaysia, New Zealand, and Venezuela, as well as the city of Denver, and parts of Florida. Even still, this breed has a devoted fan base who know that this breed can be a wonderful pet and are doing their best to educate the public of its better qualities. Because this breed was traditionally bred for characteristics such as strength and courage, rather than for looks, the appearance for these dogs can vary greatly. Though generally thought of as a medium to large sized dog, it is not uncommon for these dogs to weigh as little as 30 pounds. There are, however, a few characteristics that are prevalent in most individuals. The coat is short and smooth and it has a very well-defined muscle structure. Upon seeing this dog, you are instantly aware that you are in the presence of a powerful animal, and this will inevitably scare some who do not know of the breed’s love for humans. The body is usually a bit longer than it is tall, giving it a rectangular frame. Their head is broad and medium length, with ears that are small or medium sized that are usually high set. Its eyes are either round or almond shaped. The tail is thick at the base and tapers to a point. This dog carries itself with a proud and confident expression, enthusiastic for anything the world has to offer. 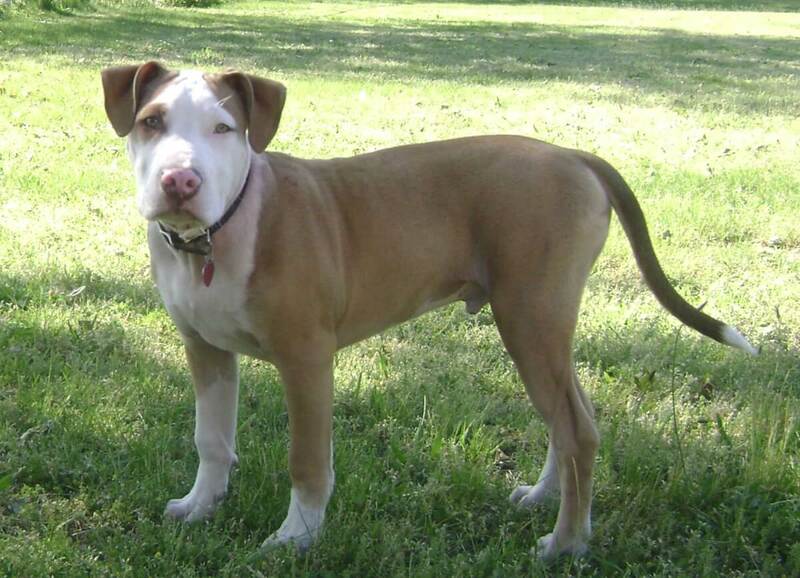 The American Pit Bull Terrier comes in just about every color and color pattern except merle. This is a medium to large sized breed. You can expect an adult male to reach a height of 18 to 20 inches from ground to shoulder. Females will reach a height of 17 to 18 inches. Weight ranges from 30 to 90 pounds. A common misconception about this breed is that they are always very large dogs. In fact, many of these dogs are not very massive at all; the misconception is largely due to people mistaking crosses or other breeds for the Pit Bull. The umbrella term "Pit Bull" is often used to describe dogs that are actually one of several different breeds, chiefly the American Pit Bull Terrier, the American Staffordshire Terrier, and the Staffordshire Bull Terrier. Though these dogs are extremely similar in both genetics and appearance, they are separate dog breeds. This confusion over "Pit Bull" breeds continues because, through history, breeders have often crossbred these different (but nearly identical) breeds and identified the offspring as the same breed. This interbreeding has led to numerous types of Pit Bulls, when in actuality a true, purebred American Pit Bull Terrier is quite rare. Curious owners can contact organizations like Bullypedia (www.bullypedia.com) or the East Coast Bully League (www.theeastcoastbullyleague.com), both of which perform canine DNA testing, to find out the true genetic makeup of their dogs. There are numerous other sub-types, but these are the most common. In regards to coat variations, the history of interbreeding can produce numerous coat patterns and density (smooth, thick, or wiry), but all known variants of this breed are short-haired. This interbreeding between similar dog breeds has also led to some size variations. 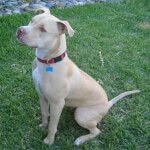 Typically, dogs of this breed range between 30 and 90 pounds, which is quite a big weight range in itself; some crossbreeds called Pocket Pit Bulls (as low as 30 pounds in weight) are often included as a variant of this specific breed, when they are in fact the offspring of an American Pit Bull Terrier and a Patterdale Terrier (and are often called Pitterdales). Some XL and XXL Pit Bulls, on the other hand, are monstrous; the biggest Pit Bull known, a gigantic dog named Hulk that was owned by a kennel in the U.S. state of New Hampshire, weighed a whopping 175 pounds. 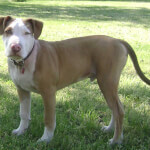 The American Pit Bull Terrier, contrary to much public belief, can be a wonderfully sweet dog. It is full of enthusiasm, confident, and devoutly loyal. Of course, what many people do not take into consideration when judging a dog is the effect its owners have on its temperament. Due to its past, this breed requires that extra care be taken when raising to make sure that the dog ends up a well-behaved member of society. Because these dogs tend to exhibit some level of aggression towards other animals and because of its powerful physique, they require an owner who will take the task of training and socialization very seriously. All puppies should be enrolled in a puppy training class where part of the time is devoted to off-leash play with other dogs. The puppy should be meeting a lot of people and its owner should firmly teach which behaviors are okay and which are not. Fortunately, these dogs are very smart and eager to please; training should be a breeze. American Pit Bull Terriers often win awards in obedience competitions and other dog competitions. In fact, there is pretty much no job a Pit Bull can’t do. They have participated in herding, guarding, hunting, policing, cart pulling, ratting, therapy, and make for great family companions. Kindness towards humans was one of the main characteristics sought in these dogs; some authorities even suggest that they may be weak guard dogs due to a tendency to greet strangers like old friends. But don’t think a Pit Bull will back down if it senses a threat. They will give their lives to protect their owner if need be. A Pit Bull can be many things. If you are thinking of adopting an American Pit Bull Terrier, it is important to realize that your actions play a large role in determining the character of the dog. Give it the training, socialization, and exercise it needs and you stand a much better chance of having the ideal dog. This breed does quite well with children. Pit Bulls have a very high rough housing tolerance and a gentle, protective way with kids, who can expect the dog to be a tireless playmate. Small children should not be left unsupervised with this dog due to its knocking over risk. This breed is known to harbor aggression towards other dogs, which should not be surprising given its blood sport history. If it will be living with other animals it is imperative that socialization start as soon as the puppy arrives at home. If the dog is around other animals from a young age it will stand a much better chance of living happily with them later on. The individual disposition of the dog and the type of raising it receives will go a long way in determining its friendliness towards strangers. Some Pit Bulls may be too friendly towards people to ever be a guard dog. Other Pit Bulls may defend their territory with vigor and hostility. Below are images and pictures of the Pit Bull Terrier dog breed. The smooth, short-haired coat is easy to groom. Weekly brushing and the occasional bath will suit this dog just fine. They are average shedders. Exercise will take some dedication and is very important. These dogs are very active and intelligent and require an outlet for this energy. These dogs require little grooming, and their coat is easy to keep clean with an occasional bath. A weekly brushing with a stiff brush and a wipe down with a cloth or chamois will keep the coat shiny and healthy. Trim the nails once or twice a month if they are not being worn down naturally. If you can hear them clicking on the floor, the nails are overdue for a trimming. It is best to introduce the dog to this practice early in life, as a stubborn Pit Bull will be nearly impossible to keep still. It is also important to brush the dog’s teeth at least two or three times a week to remove tartar buildup and bacteria. Lastly, check the ears for signs of infections on a regular basis. To make grooming easier, give the Pit Bull lots of praise and rewards; he will see the experience as a positive one rather than something to avoid. This breed is a highly energetic and loves to be active. The Pit Bull requires daily exercise not only for physical stimulation but mental stimulation as well. If given no outlet for their energy these dogs may resort to destructive behavior such as digging or chewing. Expect to exercise this dog for at least an hour a day. The more strenuous the better - these dogs will keep up with you whether you’re running, on a hike, a leisurely bike ride - you get the point. It is very important to keep a leash on the Pit Bull when taking it out. This breed has a very strong prey drive and may chase squirrels, rabbits, or any number of other animals. Remember that these dogs were bred to fight animals for many years. Be careful when taking this breed to the dog park; make sure it plays nice with the other dogs. Some owners recommend muzzling in such a situation - it is the owner’s duty to judge their dog’s character and take all the necessary precautions to prevent an unfortunate incident. The Pit Bull can be rather adaptable if given the proper exercise it needs. It is not uncommon for one of these dogs to live happily in an apartment when its owner makes a point to give it ample exercise each day. With that said, these dogs will greatly enjoy having a backyard to play in. Just make sure that the fencing is secure; these dogs are very capable climbers and may chase prey and/or other dogs. American Pit Bull Terriers can get along fine in hotter climates but are not well suited for the cold. In any case, they should not be left outside for too long because of their strong attachment to people. 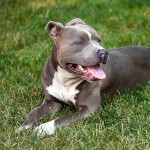 Is the Pit Bull really a "nanny dog?" The answer is no. In the 1970s, a dog-fighting advocacy group tried to establish the fact that Pit Bulls as nanny dogs--that they took good care of children--was an attribute of the breed, apparently to improve the Pit Bull's negative image. 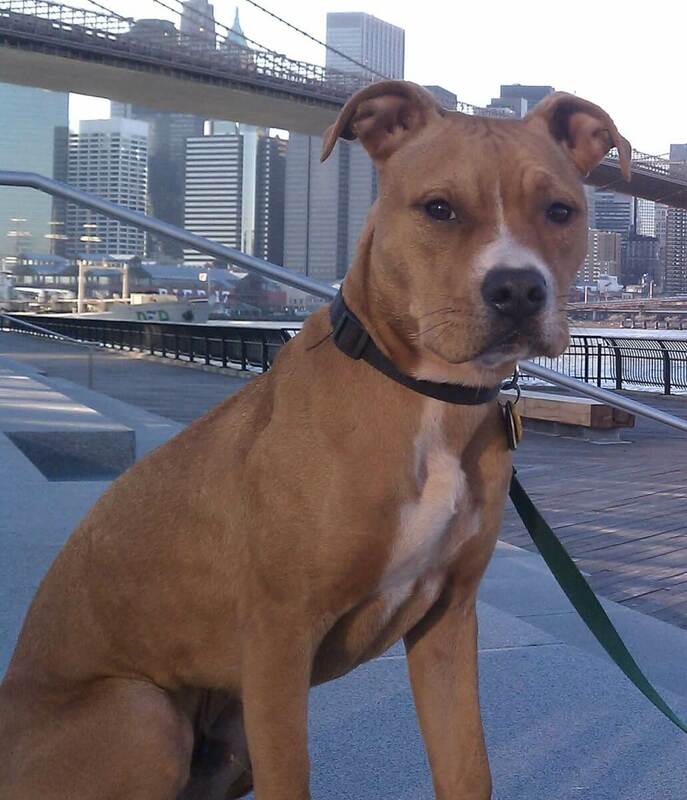 Numerous organizations, most notably one called Bay Area Dog Lovers Responsible About Pit Bulls (BADRAP), have since debunked this myth, as there was no evidence to prove that Pit Bulls had ever "babysat" kids. Does a Pit Bull's jaw lock? Again, the answer is no. Some believe that this breed's jaws can "lock" when biting something; this myth is also false. These dogs simply have incredibly strong jaws, so it may seem like their jaws lock when they latch onto something. 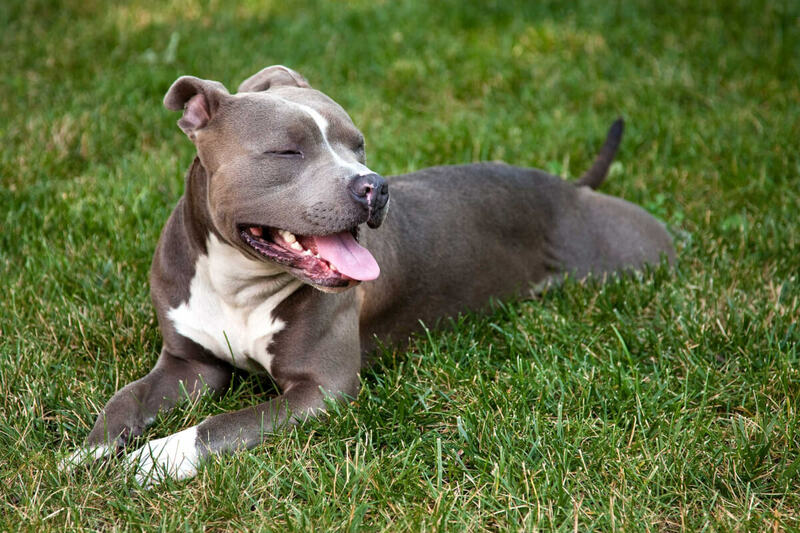 The American Pitbull Terrier (and other Pit Bull types) are nicknamed "Pibbles." Many Pit Bull enthusiasts refer to these dogs as Pibbles, which is just a slang shortening of "pit bull." Pit Bulls have been on the cover of Life magazine three times. That's more than any other dog breed. Pit Bulls are regularly used as therapy and service dogs. Despite their vicious reputation, dogs of this breed have naturally loving temperaments, and are commonly placed in positions of care and guidance for disabled and distraught people. This is considered a healthy breed, though they are prone to a few health conditions. Hip dysplasia, heart disease, and allergies are common ailments for this dog. They are also very prone to a skin condition called Demodex Mange. This condition usually starts with a loss of hair in patches, and can be serious if left untreated. Fortunately, there are remedies - get your dog to a veterinarian as soon as possible if you notice anything unusual. A Pit Bull kept healthy has a life expectancy of 12 to 14 years.